Shops and businesses across India have shut down as traders begin a protest against a new value-added tax. 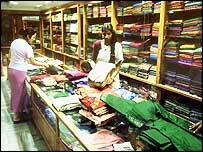 The VAT system begins on 1 April and aims to widen the tax net to help to cover India's spending shortfall. The goal is to simplify the present system for manufacturers, traders and consumers, getting rid of a wide variety of add-on tariffs. But traders say it will increase their paperwork while forcing them to pay more taxes. "Nobody knows what the rules will be. Even the tax officials are in the dark," Praveen Khandelwal, secretary-general of the Confederation of All India Traders, said. "All the shopkeepers, traders, wholesalers and retailers are one and businesses will remain closed in the entire country for three days," he said. The implementation of VAT has been delayed five times in the past decade and seven of India's 28 states say they will not implement it. But the government, which says the new rules are the most important tax reforms since India won its independence in 1947, is going ahead. Currently only a small fraction of India's one billion population pay income tax. Under the new VAT system, two rates of 4% and 12.5% will be applied. The 12.5% rate will be applied to the rest of the goods sold in India. Products including petrol, diesel, aviation turbine fuel, liquor and lottery tickets will be exempted from VAT. India's economy: Can the boom last?